Derby striker Conor Sammon missed a late penalty as Crystal Palace kept up the pressure at the top of the Championship with a win at Pride Park. Yannick Bolasie put Ian Holloway's side ahead in the first half before Sammon wasted the chance to equalise. 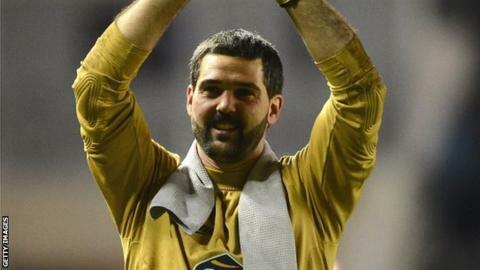 Julian Speroni tipped his 88th-minute penalty onto the crossbar after Mile Jedinak had fouled Ben Davies. Palace winger Wilfried Zaha - who will join new club Manchester United in the summer - had the first chance when he latched on to Glenn Murray's flick but shot straight at Adam Legzdins. Palace did take the lead when Eagles skipper Jedinak won a challenge inside his own half and the ball ran on to Bolasie, who took full advantage to coolly round the keeper and fire home. Jedinak hit the crossbar from 25 yards as Palace looked for a second, but they were left to thank Speroni for all three points after Jedinak caught Davies inside the area. Sammon stepped up but saw his powerful penalty brilliantly saved by Speroni to leave Derby with their first home defeat of 2013. Derby manager Nigel Clough: "We can't ask much more from the players, not just the effort but the level of performance. "To come off without so much as a point for our efforts is very harsh on the players. "We've got to improve a bit on our finishing, but we're not getting any breaks in the penalty area." Crystal Palace manager Ian Holloway: "[Derby] have got a young side who are so enthusiastic and they probably deserved better than they got tonight. "We all looked a bit nervous at the end, myself included, because we wanted it so bad. "I'm going to enjoy this because we're in with a shout of automatic promotion and that's fantastic for everybody at the club."